Packed with the power of eight superfoods, this breakfast porridge mix is the perfect start to the day, quick to prepare and delicious! Packed with the power of eight superfoods, this breakfast porridge mix is the perfect start to the day, quick to prepare and delicious! Chia means strength in Mayan and has over 3000 years of history as an ancient revered crop. As with many other superfoods, Chia was considered more valuable than gold to the Aztecs. 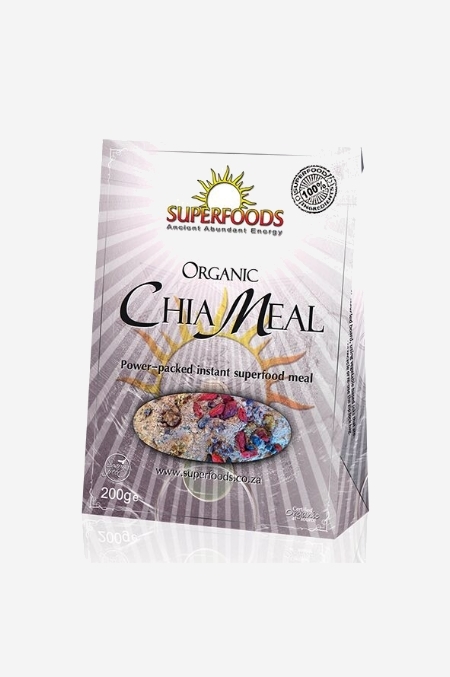 With the creamy smoothness of Lucuma and the chocolate boost of Raw Cacao, this true superfoods ChiaMeal is sure to inspire! Organic Chia Seeds, Organic Lucuma Powder, Organic Shelled Hemp Seeds, Organic Raw Cacao Nibs, Organic Raw Cacao Powder, Organic Mesquite Powder, Organic White Mulberries, Organic Goji Berries, Organic Vanilla Powder.